If Only . . . he was the boy she’s been dreaming of. 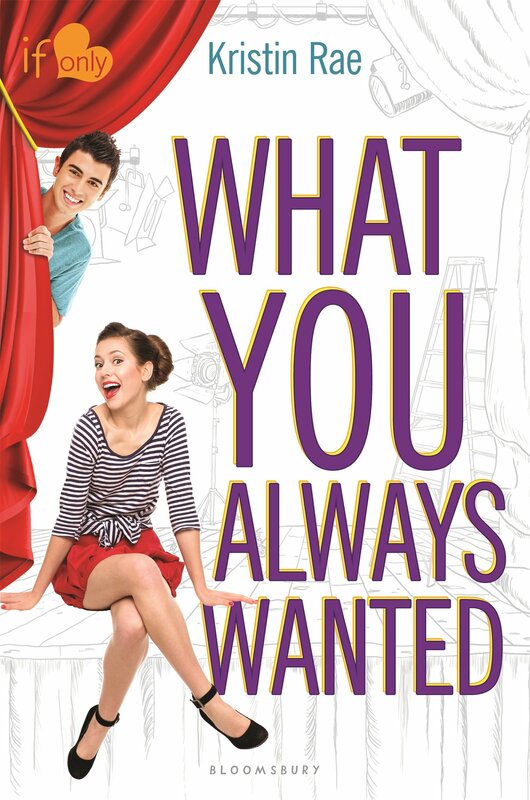 The If Only line continues in this fun high school theater-themed romance! Drama girl Maddie Brooks has always had high standards for guys. But she has yet to find one who can live up to the romantic, classic Hollywood heartthrobs, especially the dreamy song-and-dance man Gene Kelly. When Maddie begins to carpool with Jesse Morales, her new neighbor and star pitcher of the baseball team, she’s struck by his wit, good looks, and love for his family–but a guy so into sports is definitely not her style. Then Maddie discovers that Jesse was raised as a dancer and still practices in the community theater dance studio to keep in shape. Perhaps her perfect dream guy exists after all! But when it becomes clear that baseball–not dance–is Jesse’s passion, can Maddie find a way to let her dream guy go and appreciate the charms of the amazing guy in front of her? What You Always Wanted is the second novel I’ve read from Bloomsbury’s If Only romance line, and I hope to read the other stories soon. What You Always Wanted is a pretty light read, and I found myself reading through it rather quickly, which is something I often end up doing with romcoms or thrillers. I enjoyed that this book was a fun, easy read that put a smile on my face while reading it. Maddie’s not happy about her family’s recent move from Chicago to some new town in Texas. She’s very passionate about theater and ends up getting involved in the theater program at her new school right away. Her new theater teacher just happens to be her next-door neighbor who also happens to have two teens Maddie’s age. Maddie ends up becoming quick friends with Angela, who’s a year younger than her. Maddie also starts to become friends with Jesse, the star baseball player at her new school. Maddie’s one true love is Gene Kelly, a star of old classic movies, and because of this, she has high standards for any future boyfriend in her life. Jessie fits every part of her dream guy…expect that he’s into sports instead of theater. The romance was super cute. I was definitely rooting for Maddie and Jesse to get together from the start and I loved it when they finally did. Kristin Rae built the right amount of tension between the two, and I loved that she didn’t wait until the very last page for them to kiss and/or get together, which is definitely something I’ve read in quite a few books. One part I didn’t like was dragging out the getting together part with an unnecessary love triangle. However, the second guy needed up fading away as a love interest pretty quickly, which was good. Another part I enjoyed was the friendships Maddie formed. Maddie’s friends from her old school ditched after her father lost his job and they had to move to Texas. I loved seeing Maddie find new, better friends that stuck by her side and stood up for her. Every girl deserves to a really good friend, and I’m glad that Maddie was able to find a couple. Overall, What You Always Wanted was another cute romcom, and I’m definitely adding Kristin Rae’s debut, Wish You Were Italian, to my TBR pile!